No meeting next week as its now the break for the Christmas period. 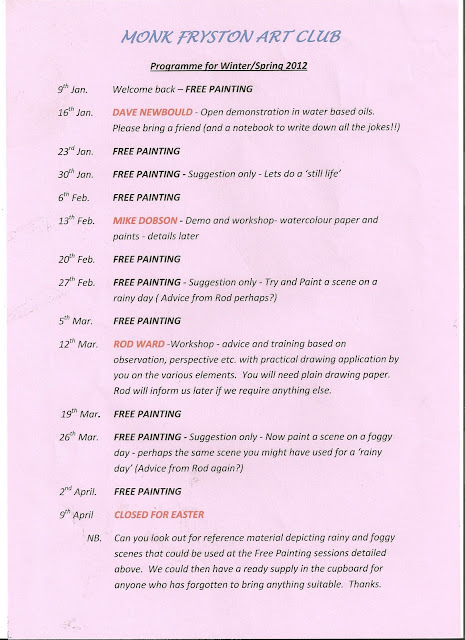 The club returns on the 9th January with a free painting session. Letters have just gone out for the yearly subscriptions so I'm hopeful the secretary wont mind it being mentioned on here. There is of course a meeting every Monday. 13th Feb Mike Dobson, demo and workshop -watercolour paper and paints, details later. 12th March, Rod Ward , workshop -advice and training based on observation , perspective etc with practical drawing application by you on the various elements. You will need plain drawing paper. Rod will inform us later if we need anything else. NB. Can you look out for reference material depicting rainy and foggy scenes that could be used at the free painting sessions detailed above. We could then have a ready supply in the cupboard for anyone who has forgotten to bring anything suitable.